Our PV generator and new metering setup is now operational for half a year; this is my next wall of figures. 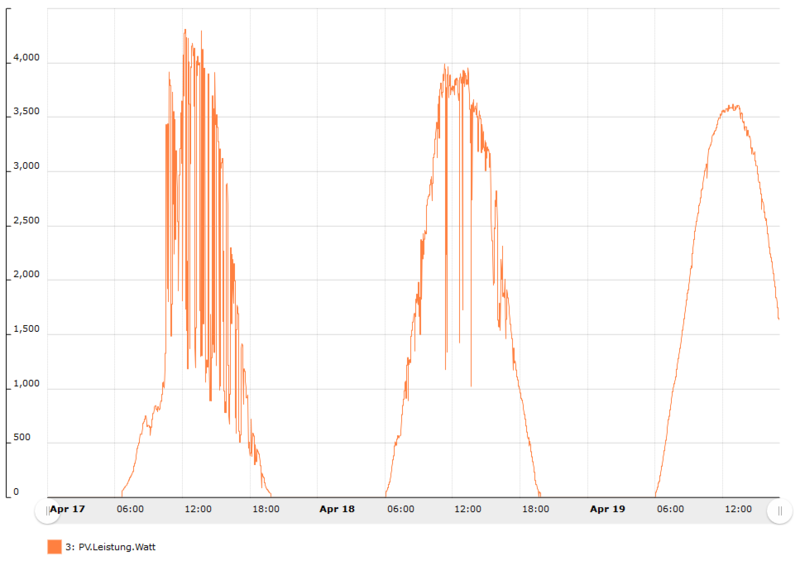 For the first time I am combining data from all our loggers (PV inverter, smart meter for consumption, and heat pump system’s monitoring), and I give a summary on our scrutinizing the building’s electrical power base load. For comparison: These are data for Eastern Austria (in sunny Burgenland). Our PV generator has 4.77kWp, 10 panels oriented south-east and 8 south-west. 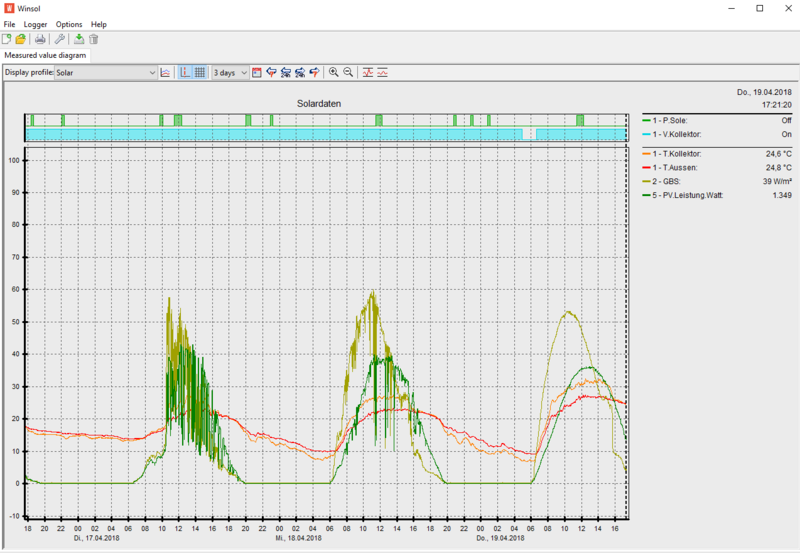 Typical yearly energy production in our place, about 48° latitude: ~ 5.300 kWh. In the first 6 months – May to November 2015 – we harvested about 4.000kWh. Our house (private home and office) meets the statistical average of an Austrian private home, that is about 3.500 kWh/year for appliances (excl. heating, and cooling is negligible here). We heat with a heat pump and need about 7.200kWh electrical energy per year in total. Total consumption of the building as the sum of the PV energy used immediately, and the energy from the utility. The same total consumption as the sum of the heat pump compressor’s input energy and the remaining energy for appliances, computers, control etc. Total energy generated by PV panels as the sum of energy used (same amount as contributions to 1) and the energy sold to the utility. In summer there is more PV energy available than needed and – even with a battery – the rest would needed to be fed into the grid. In October, heating season starts and more energy is needed by the heat pump that can be provided by solar energy. This is reflected in energy consumption: November 10 was nearly like a summer day, when the heat pump only had to heat hot water, but on the colder day it needed about 20kWh (resulting in 80-100kWh heating energy). In July, we had the chance to measure what the building without life-forms needs per day – the absolute minimum baseline. On July 10, 11, and 12 we were away and about 4kWh were consumed per day – 160W on average. We catalogued all devices, googled for data sheets and measured power consumption, flipped a lot of switches, and watched the smart meter tracking the current consumption of each device. Consumption minus production: Current values when I started to write this post, the sun was about to set. In order to measure the consumption of individual devices they have been switched an of off one after the other, after sunset. We abandoned some gadgets and re-considered usage. But in this post I want to focus on the base load only – on all devices that contribute to the 160W baseline. As we know from quantum physics, the observing changes the result of the measurement. It was not a surprise that the devices used for measuring, monitoring and metering plus required IT infrastructure make up the main part of the base load. Network infrastructure, telephone, and data loggers – 35W: Internet provider’s DSL modem / router, our router + WLAN access point, switch, ISDN phone network termination, data loggers / ethernet gateways for our control unit, Uninterruptible Power Supply (UPS). Control and monitoring unit for the heat pump system, controlling various valves and pumps: 12W. Three different power meters: 22W: 1) Siemens smart meter of the utility, 2) our own smart meter with data logger and WLAN, 3) dumb meter for overall electrical input energy of the heat pump (compressor plus auxiliary energy). The latter needs 8W despite its dumbness. Unobtrusive small gadgets – 12W: Electrical toothbrush, motion detectors, door bell, water softener, that obnoxious clock at the stove which is always wrong and can’t be turned off either, standby energy of microwave oven and of the PV generator’s inverter. Refrigerator – 27W: 0,65 kWh per day. WLAN access point and router for the base floor – for connecting the PV inverter and the smart meter and providing WLAN to all rooms. Non-24/7 office devices – 21W. Now turned off with a flip switch every evening, and only turned on when needed. Scanner/Printer/Fax: 8W. Surprisingly, there was no difference between ‘standby’ and ‘turned off’ using the soft button – it always needs 8W unless you really disconnect it. Server in hibernated state 4W. Note that it took a small hack of the operating system already to hibernate the server operating system at all. Years ago the server was on 24/7 and its energy consumption amounted to 500kWh a year. Stuff retired after this ‘project’ – 16W. Radio alarm clock – 5W. Most useless consumption of energy ever. But this post is not meant as bragging about the smartest use of energy ever, but about providing a realistic account backed up by data. Test and backup devices – 7W. Backup notebooks, charging all the time, backup router for playground subnet not really required 24/7, timer switch most likely needing more energy than it saved by switching something else. Second old Uninterruptable Power Supply – 4W. used for one connected device only, in addition to the main one. It was purchased in the last century when peculiarities of the local power grid had rebooted computers every day at 4:00 PM. In total, we were able to reduce the base load by about 40W, 25% of the original value. This does not sound much – it is equivalent to a small light bulb. But on the other hand, it amounts to 350kWh / year, that is 10% of the yearly energy consumption! Temperature / compressor’s electrical power: Universal control UVR1611 and C.M.I. as data logger, logging interval 90 seconds. Temperature sensor: PT1000. Power meter: CAN Energy Meter. Log files are exported daily to CSV files using Winsol. Logging interval: 90 seconds. PV output power: Datamanager 2.0 included with PV inverter Fronius Symo 4.5-3-M, logging interval 5 minutes. Consumed energy: Smart meter EM-210, logging interval 15 minutes. CSV log files are imported into Microsoft SQL Server 2014 for analysis and consolidation. Plots are created with Microsoft Excel as front end to SQL Server, from daily and monthly views on joined UVR1611 / Fronius Symo / EM-210 tables.